What is Rabbit Viral Hemorrhagic Disease and Why Should You Care? Rabbit Viral Hemorrhagic Disease (VHD) is a highly contagious disease caused by a calicivirus that affects only rabbits of the Oryctolagus cuniculus species. This includes wild and domesticated European rabbits, from which our own domesticated rabbits are descended. VHD does not affect humans or other animals. In Spring 2018, an outbreak of VHD started in the Nanaimo area on Vancouver Island and spread to Annacis Island in Delta, as well as Richmond, BC. April 2019 Update: the virus has reappeared in Parksville on Vancouver Island. 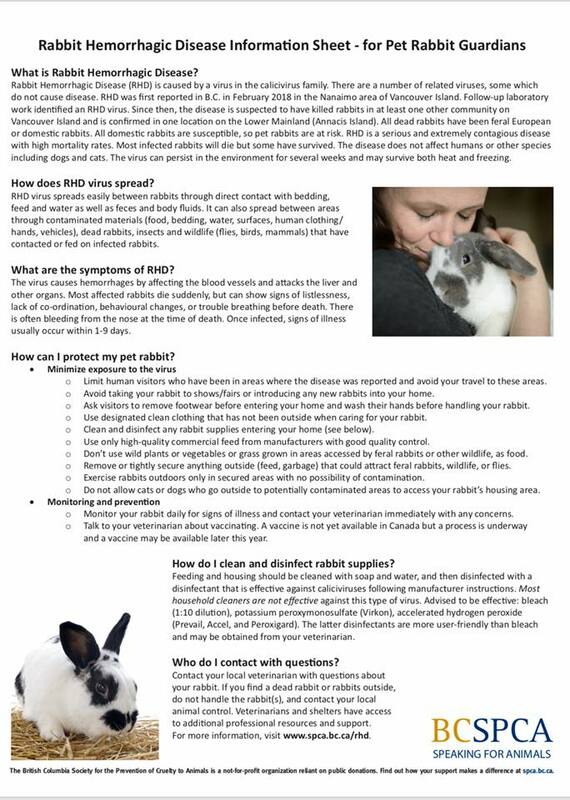 All VRRA rabbits were vaccinated against Rabbit Hemorrhagic Disease in 2018 and will be re-vaccinated in 2019. It is vital that you vaccinate any rabbits that you have. This is the only way we will defeat this horrible virus. It makes no difference if your rabbit stays indoors. The virus spreads on feet, clothing, car tires, other pets (especially dogs). You cannot isolate your rabbit(s) well enough to be safe. If you need to find a veterinary clinic that does VHD vaccinations, contact us.